Recognized in art schools and by designers worldwide as the reference point for ink, Pebeo Colorex water-based inks come in a lively range of 60 colors. This highly-pigmented ink is ideal for professional illustrators and designers due to its amazing concentration, luminosity and perfectly flat, uniform, velvety finish. 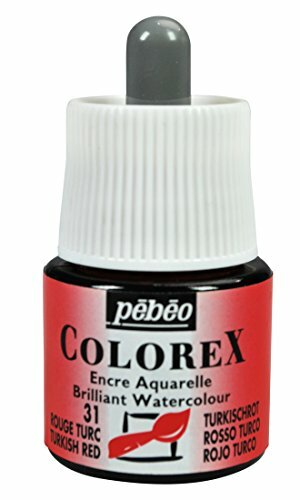 Colorex Ink withstands heavy dilution in water. Pure or diluted, it can be applied with different tools (airbrush, brush, pen...) on various surfaces (paper, Bristol board, canvas boards...). The completely opaque White, brightens the different colors and lets you extend the range to create pastels. The three primary colors as well as the Trichromatic Black are perfectly balanced chromatically, facilitating the mixing of colors. The Silver, Rich Gold and Pale Gold metallic colors are generally used pure. Like all inks, Colorex is sensitive to ultraviolet rays. To avoid the excessive fading of color over time, illustrations can be protected using a UV absorbent varnish. Daler-Rowney FW Artists' Ink black 6 oz.